Is there an online duty of responsibility (to act like an adult)? Big Brother: not just the government, anymore. As sure “as the day follows night,” Apple has been sued for its iPhone location tracking. Whether the suit survives a summary judgment motion is another question. Own an Android? An iPhone? Google & Apple may be tracking you. Scarier than the government: Is Steve Jobs the real "big brother" that is watching you? In fact, no maybe about it. They are. Google and Apple are gathering location information as part of their race to build massive databases capable of pinpointing people’s locations via their cellphones. These databases could help them tap the $2.9 billion market for location-based services—expected to rise to $8.3 billion in 2014, according to research firm Gartner Inc.
via Apple, Google Send Cellphone Location – WSJ.com. I admit it: I like Google. It makes life easier. Occasionally, when I am given an issue to research by one of the partners, I’m inclined to just punch it into Google, if just to see what comes up, hoping that maybe I’ll get lucky and find the answer right away. Sometimes it works; usually, it doesn’t. In fact, usually, I end up wasting me a lot of time looking through links that are only marginally helpful to my research. With Google, you never know what kind of research you’re going to get. On the other hand, if I can discipline myself to hit the library, start with something broad, like the Corpus Juris Secundum, I’m more likely to find what I’m looking for. The CJS, to continue using it as an example, provides a broad overview of the law. It gives the landscape that I’ll be walking through as I look for whatever arcane and minute point I’ve been tasked to find. At that point, with what I call a 20,000 foot view of the issue (as in, 20,000 feet up), it’s easier to zero in on whether I need to hit the statutes, case-law, or a treatise on the topic. I know where to start getting specific, what stuff to ignore, and what some of the vocabulary I’m likely to run into means. Now, don’t get me wrong: I still end up using Google. But then it’s usually Google Scholar to look up a specific case, or just to see what else might be available out there. APROPOS: This principle applies beyond law. I see a lot of friends citing things like Wikipedia for their research. Wikipedia is a great tool to get started on research–like the CSJ it provides a broad overview of just about every topic under the sun. However, it’s just that: a great place to start. Good research is going to dig deeper, check whether Wikipedia has cited relevant and trustworthy sources, and add further research. It’s just the 20,000 foot starting point, not the answer. GOOGLE + JURIES = PROBLEMS? Under the constitution, an “impartial jury” is guaranteed in criminal trials. However, with the advent of the internet, Google, and online social media, impartiality is becoming more questionable, and jurors are taking over their role as fact finders out of the court room and directly to online searches. And it has observers wondering if an “impartial jury” is even possible, anymore. With technology continually evolving, the justice system will need to find ways to compensate, argues Caren Myers Morrison, an assistant professor at Georgia State University College of Law in an article titled Can the Jury Trial Survive Google? published the ABA’s Criminal Justice Winter 2011 issue. Today, most jurors have access to news stories, television segments, blogs “opinions,” criminal records databases, social network pages, and general research tools such as Wikipedia and Google at their fingertips. And the have not been shy about availing themselves of these resources. I’ve heard it joked that people on jury duty are not the brightest individuals, as evidenced that if they were they would have gotten out of jury duty in the first place. 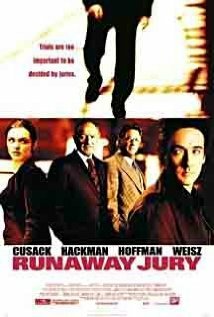 John Cusack starred with Gene Hackman and Dustin Hoffman in the movie version of John Grisham‘s novel Runaway Jury, in which Cusack played man who got himself placed on jury duty, where he then manipulated the other members of the jury to get revenge on an unscrupulous gun manufacturer. It featured black and white caricatures, but the lesson was real–juries can be manipulated by sophisticated individuals using expert knowledge of the facts and of the law. In Grisham’s world, the good guys won, but in the real world, it isn’t nearly so black and white. The rules of evidence are designed to keep a tight lid on attorneys in court, to assure a level playing field, as best as possible, with the power of the state and prosecutor on one side and the rights of the defendant, presumed innocent until proven guilty, on the other. As jurors are able to begin accessing information outside of those guarded limits, “impartiality” becomes an open question. So, with that frustration in hand, jurors head home at night, open their laptops, and start Googling. That is, when they haven’t already started searching from their mobile phones while still in court. Morrison lists several problems for the impartial jury due to easy access to the internet. First, juror blog postings, status updates, and tweets “might chill robust discussion inside the jury room.” Why speak up if your fellow jurors are going to lam-blast you online? Second, jurors use the internet to ask for opinions. It’s a violation of the jurors oath, even if it does occur only rarely. Another major problem, one well demonstrated by “Runaway Jury,” is improper contacts with jurors. Facebook, MySpace, eHarmony, and Twitter all present ways that jurors can be contacted, and can contact, defendants, witnesses, and attorneys associated with the case, to say nothing of the media. The more people are linked through a complex of contacts, listservs, dating databases, and friend pages, the more these chance encounters become likely, causing not only the embarrassment of seeing trial participants in unexpected contexts, but also possible prejudice to the parties. Who could take an expert seriously after learning that he is looking for “that special someone”? Jury Instructions: specifically advise jurors that they are, as the Federal Judicial Conference has modeled, not to access the Internet using their telephone, cell phone, smart phone, iPhone, Blackberry or computer, nor to chat about the case in chat rooms, blogs, or websites such as Facebook, My Space, LinkedIn, YouTube or Twitter…etc., etc., etc. Explain why. If jurors understand, they are more likely to listen and heed the instructions. For extremely short trials, confiscate electronic devices as jurors enter the courthouse. However, this won’t help in any case that last more than one day. Allow jurors to take notes, ask questions of the witnesses, and request clarification. Questions can be written and submitted to the judge to ask, and they can help jurors feel more able to get access to the information they need to make a judgment. Zero tolerance for juror contacts. The threat of fine or contempt of court should be a fair and sufficient method for keeping jurors from making inappropriate contacts during trial. Morrison’s article “Can the Jury Trial Survive Google?” is a fascinating look at the problems juries face in the age of Google. It shares a wealth of anecdotes and insights. It’s not available online yet, but should be in the next couple months. Morrison also has an excellent paper on the topic here.